US Army Garrison Vicenza is mainly located on the Italian base Caserma Ederle in Vicenza, Italy. The Vicenza Military Community, VMC, consists of several installations in the area including Caserma Ederle, Caserma Del Din, Villaggio housing, Longare reserve site, Torri di Quartesolo, Lerino and Marolo. The garrison's mission on Vicenza is to provide base support operations for US personnel in the area. Deployment support services of tenant units are also conducted on base. Major units include the Headquarters of US Army Africa/ the Southern European Task Force, the 173rd Infantry Brigade Combat Team and the 509th Signal Battalion. 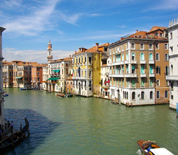 The base is only a short drive from the cities of Venice, Verona, Florence, Milan and Bologna. This USAG Vicenza directory features the critical info you’ll need to navigate through the many facilities and recreational opportunities available on base.